The California Trail Interpretive Center located in Elko, Nevada is a prime location for Nevada field trips, group hikes, group visits, family reunions, college history classes, and historical groups. We are equipped to handle any group needs, large or small. The center has a variety of services available, including group accommodation. Come enjoy the beautiful, serene wide open spaces we have to offer. What Kind Of Groups Can The California Trail Interpretive Center Accommodate? The historical California Trail is a unique element of Western American history. Especially when it comes to the California Gold Rush. 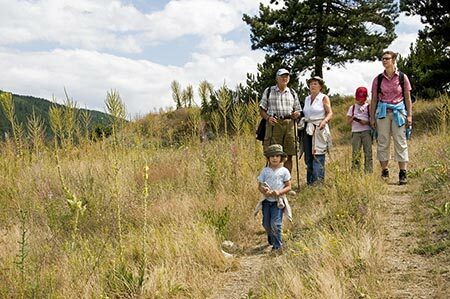 The interactive exhibits, regular activities, and fun hikes at the California Trail Interpretive Center is a wonderful way to entertain and educate any group. The staff at the California Trail Interpretive Center will also be able to help you with any of your information needs. Whether that’s a little more about the history of the area or the best local place to grab a bite to eat. If you are curious about planning an event, group meetup, field trip or excursion, our friendly and knowledgeable staff will be able to assist you. Whether you are trying to figure out the logistics of your trip or want to pick up valuable historical tidbits about the area, we will go out of our way to help. We can also assist with your accommodation needs, information on local happenings and what’s going on in the area. Who Is The California Trail Interpretive Center For? Regardless of whether you are planning a large or small event, The California Trail Interpretive Center is a great place for everyone. If you are a history group or a photography class seeking inspiration from the scenery, The California Trail Interpretive Center is the place for you and your group. It has been designed to manage any group size with a diverse range of interest. The California Trail Interpretive Center in Elko, Nevada is ready to help your group plan a successful outing. Our knowledgeable and friendly staff can assist with any questions you have and your accommodation needs. Be sure to check out our interactive exhibits, regular activities, and fun hikes.